STS-130 shuttle commander George Zamka accepts rocks from the moon and Mt. Everest from Scott Parazynski to fly them to the space station. Two smallrock samples ? one from the top of our world and the second returnedfrom another ? are ready to launch to the International Space Station(ISS) as a symbol of NASA's continuing mission to explore. The space-bound stones ?a fragment of Mount Everest's summit and four flecks from the moon ? werepresented Wednesday to George Zamka, the commander of NASA's nextspace shuttle mission, by the first astronaut to scale the Earth's highestmountain, Scott Parazynski. 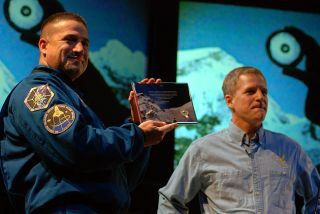 "Theserocks have already done more than a human being could do ina lifetime," said Zamka during the ceremony held at SpaceCenter Houston, the public visitor center for NASA's Johnson Space Center in Texas. "For four billion years they were on the moon,undisturbed. They went through an ascent on a spaceship traveling toEarth and then Scott took them to the limits of human endurance byclimbing up with them on Mount Everest. So they already have atremendous history. They're about to get a mileage upgrade." "Whenthey go on the space station," he continued, "they are goingto travel at 17,500 miles an hour for a number of years. They are goingto have a tremendous trip." Parazynski personallyretrieved the Everest rockwhen he reached the 29,000-foot mountain's peak on May 20, 2009 whilecarrying the four fragments of the moon collected by Neil Armstrongand Buzz Aldrin during the first U.S. lunar landing mission 40 yearsearlier. "Theselittle samples were collected literally worlds apart," Parazynskitold collectSPACE.com. "But there are other worlds for us to goexplore, and [the space station crews] are going to be a part of it." Zamka, whowith his STS-130 crewmates are scheduled to launch to the ISS onboardspace shuttle Endeavour on Feb. 7, will install the rock samples insidethe Cupola, a window-studded viewing port attached to the new module theyare adding to the outpost. Named "Tranquility" for the Apollo 11site where the lunar crumbs were retrieved, the module will house the station'slife support systems. This isn'tthe first time that fragments of Everest and the Moon have flown to thespace station, though it is the first mission on which theyhave flown together. NASA secretlystowed a 21-gram lunar rock, alsobrought back to Earth by the Apollo 11 crew, aboard a March 2009 shuttleDiscovery mission as part of its 40th anniversary celebration for thefirst lunar landing. After floating aboard the orbiting outpost for a fewmonths, during which time it starred in a downlinked video from the ISS,the moon rock was brought back to Earth but not before being scheduled foranother flight. NASApledged to fly the rock back to the Moon on its first mission toreturn humans to the lunar surface, a symbolic gesture that hearkenedback to 1972 and the Apollo 16 mission that delivered an Apollo12-collected rock back to the Moon as part of a science experiment. The moonrocks that Parazynski toted up Everest and are next to fly with STS-130 --four small chips that together weigh just 0.05 grams -- were originallyencased in acrylic for another symbolic mission: a goodwillgift. By order of then-President Richard Nixon, approximately 250similar button displays were created in late 1969 to be distributed to the U.S. possessions and states as well as 135 foreign nations. Thenow station-bound set was left over from that original allocation. It wasanother nation, Canada, which brought the first piece of Everest to thespace station. In Sept. 2006, STS-115 mission specialist and CanadianSpace Agency astronaut Steven MacLean flew a pebble from 'the top ofthe world' that had been retrieved by Canadian mountaineer Bernard Voyerin May 1999. MacLean,who in 2008 became president of the Canadian Space Agency, returned the Everestrock to Voyer in April 2007. At leastone other piece of the peak has flown to space. A rock collected in 1963during the first ascent of the West Ridge of Mount Everest flew withthe personal items of mission specialist and medical doctor James Bagianon the 1991 STS-40 Columbia mission. Parazynski,who like Bagian has a medical degree, gave NASA a rock he collected onhis second attempt at Mount Everest. His first climb a year earlierin 2008 ended early due to his suffering a back injury. TheNASA-prepared plaque to which both the moon rocks and Mount Everest rockwere attached for their flight to space includes an inscription dedicatingtheir journey with Parazynski to "honor explorers and heroes NeilArmstrong and Sir Edmund Hillary," the first men respectivelyto walk on the Moon and summit Everest. Continue readingat collectSPACE.com about the rocks' mission to challenge space explorersand to see more photos from the handover ceremony.